A door dealer's professional knowledge is a valuable result of their training and experience, and when called upon for service or for technical advice, it is proper that they be paid for rendering these services. 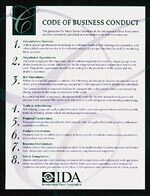 The Code recognizes the important role of contract negotiation in which a single garage door dealer is selected on merit, followed by the development of required construction details and costs. Negotiated agreements should be in writing for the protection of the dealer and the dealer's customer. When the sealed bid process is utilized, the following should apply: Dealers should not seek to obtain price information concerning a competitor's bid or proposal before all bids are submitted.The figures in a bid or proposal shall not be changed after submission unless a corresponding change is made in the scope of character of the work.In submitting bids or proposals, the dealer shall carefully identify materials to be used and services to be rendered. The dealer shall take care to avoid ambiguous or misleading terminology. Proposals and product installation shall comply with all applicable building codes, ordinances, regulations and laws. Products shall be installed in accordance with the specific installation instructions provided by the product manufacturer. Dealers shall avoid conduct or practices likely to discredit the door systems industry, and honor their obligations and commitments to customers, employees and suppliers. Dealers shall provide a safe working environment for employees and shall comply with applicable safety regulations. In addition, dealers shall inform customers regarding safety features of products and safety precautions to be taken in the operation and maintenance of a door system.